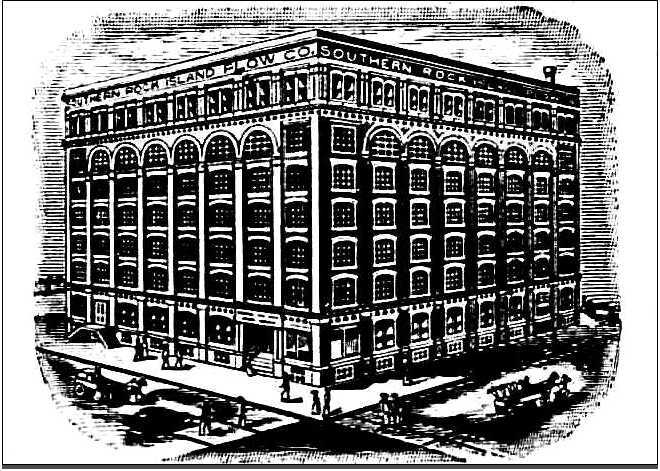 Behold, the Southern Rock Island Plow Company building. Looks familiar? Perhaps “Texas School Book Depository” is an easier hook to hang your hat on. When Dallas seemed to be farm implement-central, there were numerous plow companies in business here. This is the second Southern Rock Island Plow Co. building — the first one (built in the same location around 1898) burned down when it was struck by lighting. The building that still stands was built in 1903, and it is, without question, the most famous building in Dallas. …And it’s probably not that far behind the Alamo. Ad from the 1908 city directory. Photo from the Building, Plumbing, Gas & Electrical Laws of the City of Dallas (1914). More on the history of the Dallas branch of the Southern Rock Island Plow Co. can be found here. For more about what’s going on with the building these days, see the Dallas Morning News article “Dallas County May Move Offices Out of Historic School Book Depository” by Matthew Watkins, here. For more on the various incarnations of the building (which, by the way, is officially called the County Administration Building and which now houses county offices as well as the Sixth Floor Museum), see my previous post, “The Sexton Foods Building and the Former Life of the School Book Depository,” here.